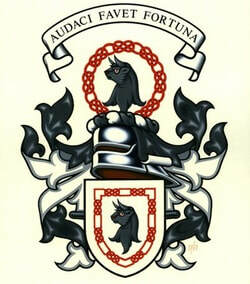 The Turnbull Clan's very foundations originate in Rulewater, where William O'Rule saved the life of Robert the Bruce and was granted lands and the title of Turnbull. The Turnbull Monument is located near the Heritage Hub, the creation of artist Angela Hunter, this magnificent sculpture encapsulates the moment when William O'Rule turned the bull that threatened the life of Robert the Bruce. ​It is now customary for visitors to be photographed next to the Bull as part of their visit to the town. The village of Bedrule is an important place for Turnbull clan members, the church, site of the castle and the commemorative cairn are must-see sites on their family journey. The Elliot Clan held territories in Rulewater as well as Borders wide and have some remarkable women leaving their legacy to inspire future generations. Baroness Elliot of Harwood was the first female speaker in the Houses of Parliament other than the Queen. She had a kind and generous heart, helping finance many buildings in Hawick and brought the community together at her home on the Harwood Estate. Jean Elliot of Minto wrote the Flowers of the Forest in 1776. There is a Lady Elliot reef in Australia named after a ship The Lady Elliot which was wrecked there. An essential guide for anyone interested in learning more about the history of Rulewater. And its People. Authors Kenneth and Norman Turnbull of the Borders Turnbull clan, guide the reader through the exploration of the most important and exciting heritage sites in the Borders of Scotland.